Aaaaah… Passwords! Why write a blog article about them. Everything has alreay been said about passwords. Everybody hates them because they are hard to remember, because we should change it regularly, because we have way too much of them. They are often present in security awareness campaign (see the article introduction picture). And despite this, people are still managing their passwords no matter how! 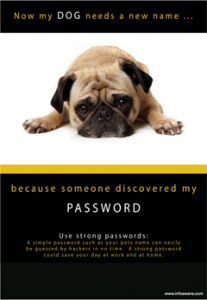 I won’t repeat the same blah-blah about how to take care of your passwords, how to generate them, stop! Here is just another proof that human behavior won’t change. In what city dod you meet your spouse/significant other? Some of them are good, others are weak because the answer can easily be found on public resources! But there is a worst case: when the website lets people choose their own hint! As you can see, just be reading the dumb hints, it could be easy for an attacker to search for publicly available information and build a good (small) dictionary of passwords! No need to loose time in decrypting the passwords… Sometimes, the hint is also disclosed on the password recovery page just after submitting the email address (which is very easy to guess). No need to have access to a leaked database! When you register on a website, it is important to choose a good hint (or better, don’t use one) and save your passwords in a password manager. Keep this in mind!